Easterseals Iowa provides exceptional services to ensure that all people with disabilities or special needs and their families have equal opportunities to live, learn, work and play in their communities. We provide a wide range of support for children and adults with disabilities to promote independence and opportunities throughout their lives. Easterseals Iowa gives the gift of hope, create change and find solutions. 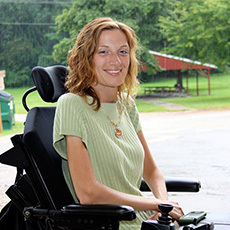 “When I was newly disabled, Easter Seals Iowa offered me hope and encouragement, that I too could be a productive part of society after acquiring a disability. With the support of Easter Seals Iowa, I am doing just that - working, volunteering, and enjoying life to the fullest,” Angie says.